Meet the remote battery disconnect that makes sure an RV's batteries are alive and well and ready for the road. Intellitec's Battery Disconnect is an easy-to-install system that will allow RV owners to disconnect coach and chassis batteries with just the touch of a switch. With Battery Disconnect, the owner can be sure the batteries are disconnected when his RV is not in use or is being stored off-season. And it s all remote, conveniently located inside the RV. The heart of the system is a unique latching relay developed specifically for this purpose. 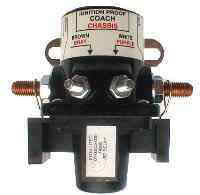 While this relay is capable of carrying heavy coach currents, it requires NO power to stay open or closed. It only draws power during activation. The relay is sealed against the environments and designed to withstand the shock and vibration experienced in the most severe RV or boat applications. To close the relay, +12 volts is applied to the "I" terminal and ground to the "S" terminal of the relay. When this is done, the plunger is pulled into the coil and the contacts are connected. While this happens, the rod magnet suspended above the plunger is attracted to the top of the plunger by the magnetic field. When the voltage is removed from the coil, the plunger gets pushed upward by the return spring, but cannot move because the rod magnet is in the way. Unwanted battery drain during storage, or when the RV is not in use, isn t the only customer benefit of Battery Disconnect. Batteries are protected from overcharging when the RV is plugged in for an extended time, and shorts or fire hazard are also prevented while working on the 12-volt electrical system. The 01-00055-302 is for Battery control centers for the Fleetwood and Jayco 2001 and newer.